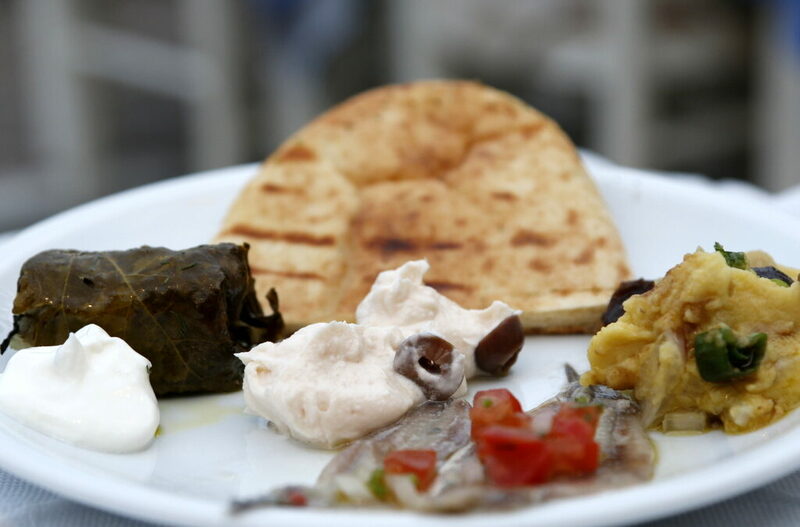 Greek cuisine has so much to offer. So much it is often difficult to choose from the menu. 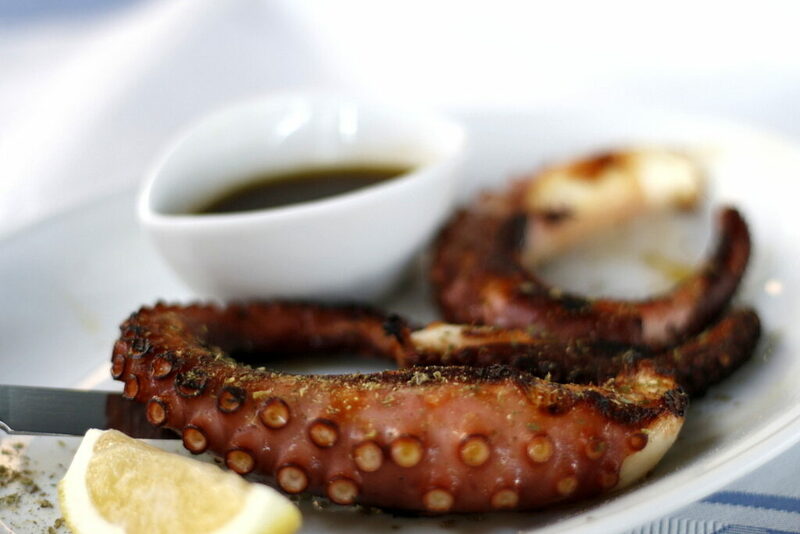 Here is a list of our favourite 15 dishes you should try in Greece. They are not in any particular order (well, maybe the first 3 are our favourites). There are vegan, vegetarian, fish, seafood dishes and one meat option – we don’t want to discriminate any eating preferences. You should know though that Greek cuisine is super rich with vegan and vegetarian dishes hence so many of them on this list. One of the most undervalued products. It has a ton of protein, which makes it a great replacement for meat, fish and dairy if you are a vegan. In Greece you can find it in any supermarket or local shop. Any traditional Greek taverna should have it on the menu. It is usually served with red onion (sometimes caramelised) or capers (or both) and a handsome gulp of olive oil. 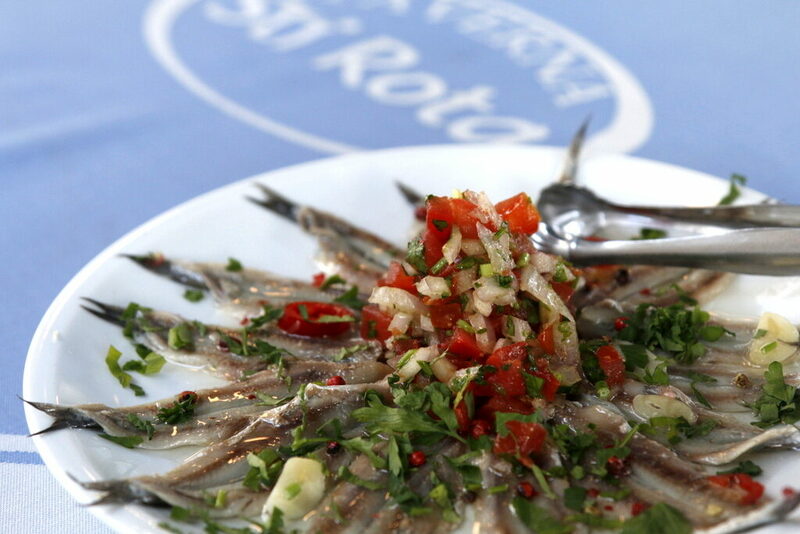 We also like to add some feta or gavros marinatos (marinated white anchovies) – check point 3. It’s a great marriage of flavours. This dish is a MUST when you are in Greece! 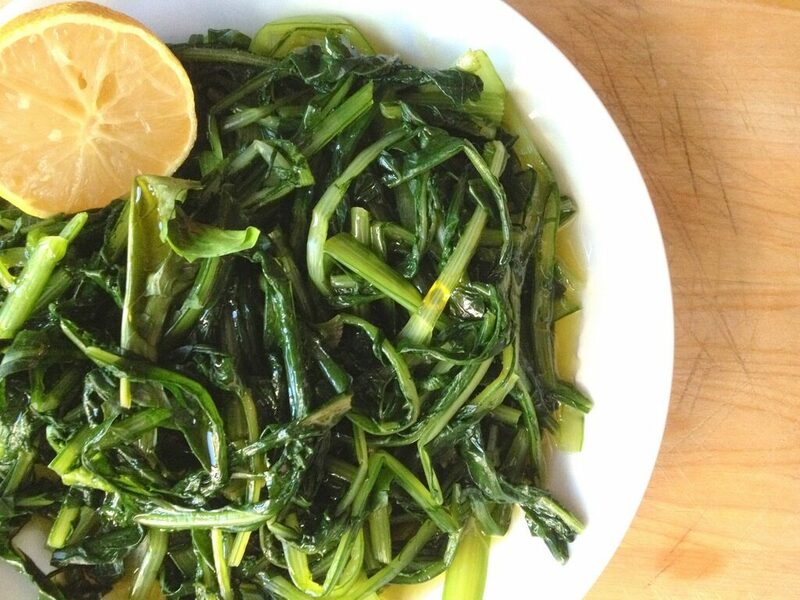 Have you ever tried eating dandelions (its leaves to be exact)? You would be surprised how many health benefits they offer! Horta in Greek means any green leaves found in the wild, including dandelions. During the II World War wild greens literally helped save lives as they were one of few food items available to the locals. Today you can find horta in pretty much any taverna. It is served boiled with olive oil, lemon and a touch of salt. You can also find it in local farmers’ markets and grocery shops. Or you can learn how to distinguish edible horta and collect it yourself on your next hike. Some kinds of horta can be mistaken with rocket (rucola, another wild green). Don’t try eating it raw, it is very bitter! Wild greens is a great side dish for your fish order, but you can also enjoy it on its own together with other meze style dishes. Spring is the best season but you can find it all year around. This is Magdalena’s favourite dish in Greece. White anchovies are indigenous to the Aegean waters and they taste completely different to traditional anchovies, with much more delicate flavour. Plus, small fish like gavros is an excellent source of Omega 3 fatty acids. 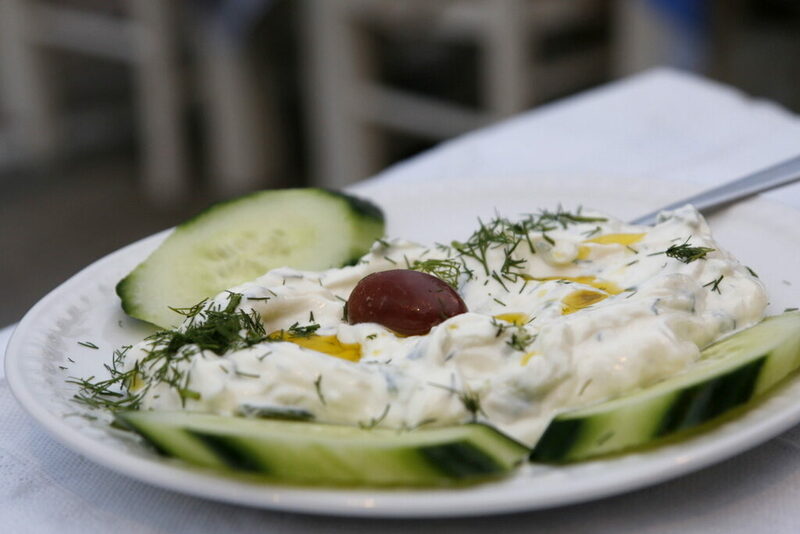 Our favourite way of eating gavros is marinated in vinegar with some garlic and oil (sunflower or olive oil). You can also find it fried, but in our opinion the taste is so much better when it is marinated. It combines incredibly well with fava. Add some capers and red onion on top and voila, a fabulous light and healthy meal right there! 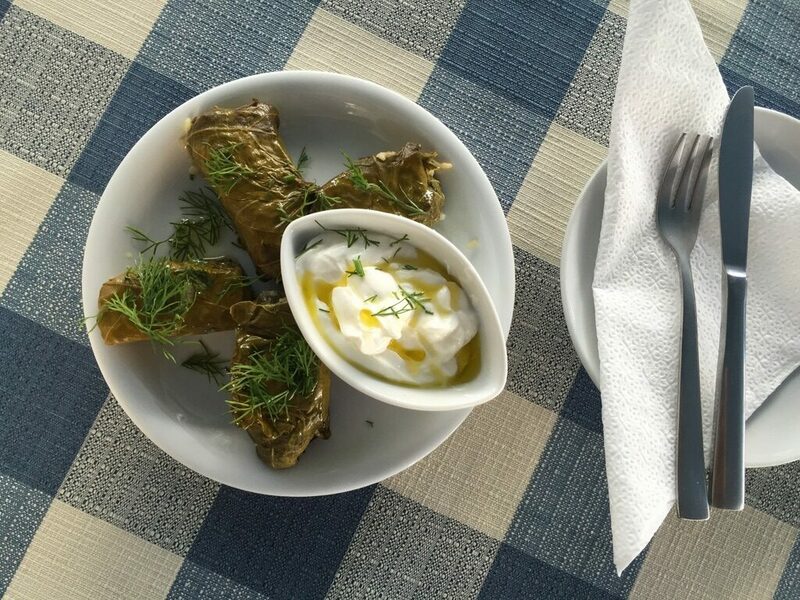 Take vine leaves, add rice flavoured with fresh herbs and roll them up in bite sized parcels. As simple as it is delicious! Dolmadakia may be prepared with mince meat, but in our opinion the better version is the non meat one. It is served with a splash of lemon and often Greek yoghurt on the side. An excellent vegan meze. Greek cuisine is simple and involves few, if any spices. The trick is only one: using fresh, seasonal produce. This dish is not any different. 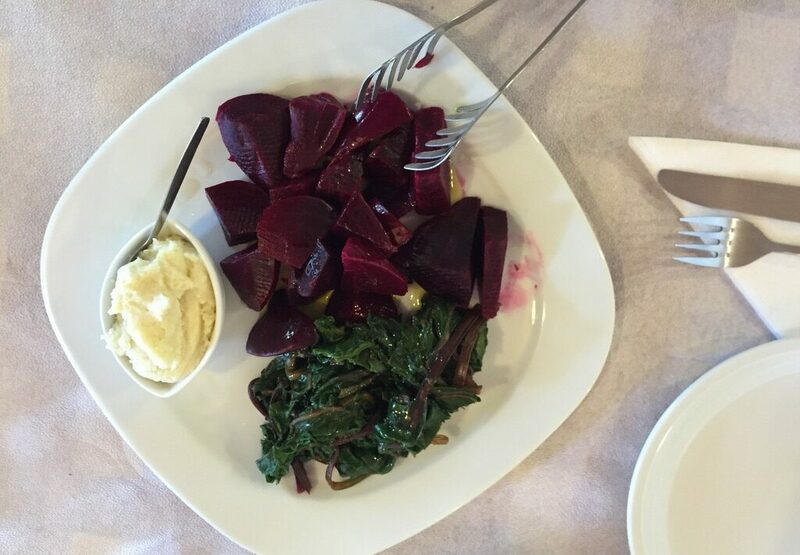 Boiled beetroot (including the leaves, which we find even more yummy than the root itself) with some olive oil and lemon juice (or vinegar) served with a garlic-potato dip. So simple yet so tasty. 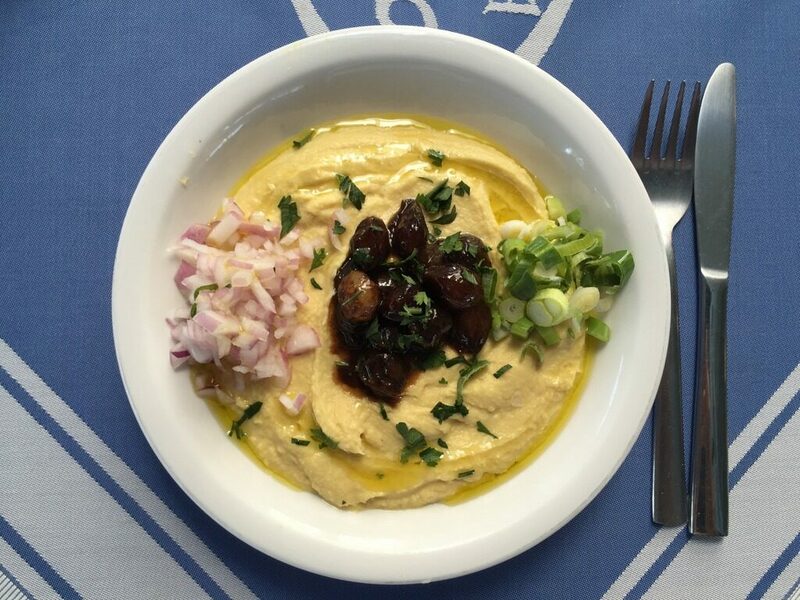 It can be one of your meze dishes or you can have it as a side dish with your fish or meat order. 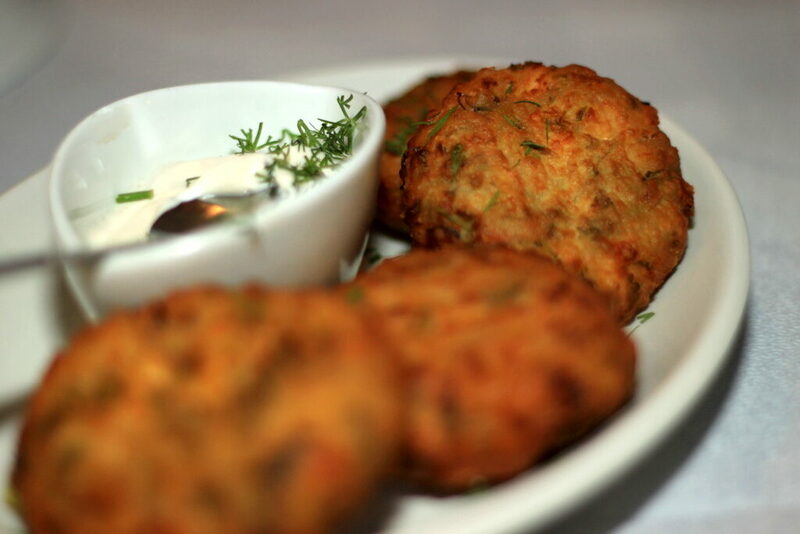 Courgette or zucchini fritters are another traditional meze style dish you should give a try. There are different ways it can be prepared so if you are vegan ask the chef in case any eggs and/or feta cheese were used. You can usually enjoy kolokithokeftedes with a touch of greek yoghurt or tzatziki (see point 9 :-)). 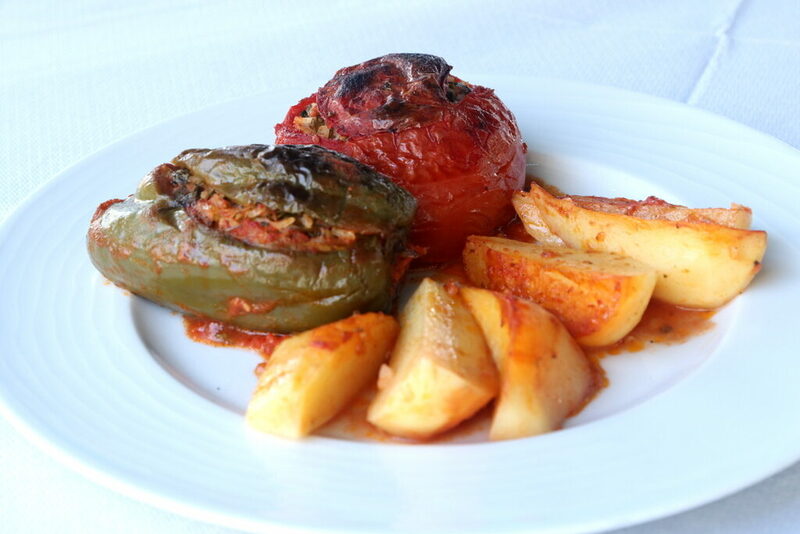 Yemista or stuffed tomatoes and peppers is often our favourite choice for lunch. The best period to eat yemista is during summer/autumn season when tomatoes and peppers are ripe and full of flavour, but you can find them served all year around. They are usually stuffed with rice, a variety of herbs and garlic. Traditionally yemista is served with baked potatoes, which makes it a perfect full meal. Vegan friends, just double check that no mince meat was added to the recipe! For those who, like us, enjoy feta cheese (in Greece you can add feta to almost any dish! ), you can sprinkle some on top for extra protein. The key here is (again) freshness. The best time to find freshly caught octopus is March and April, before the procreation season in May (during which octopus fishing is strictly forbidden). Of course, you can enjoy it also in summer, when you will often see octopus tentacles being dried up in the sun. If the octopus is fresh (not previously frozen) the best way to eat it is from a grill. You can distinguish between fresh and frozen octopus by testing how chewy it is – the chewier the fresher. Another way to serve octopus is marinated in vinegar, olive oil and herbs. The texture is much softer in this case. This dish does not need an introduction. The most important ingredient is of course Greek yoghurt, which is thick and unsweetened. Add some grated cucumber (remember to squeeze the juice out before mixing it with the yoghurt), fresh dill, garlic, olive oil and a dash of vinegar. 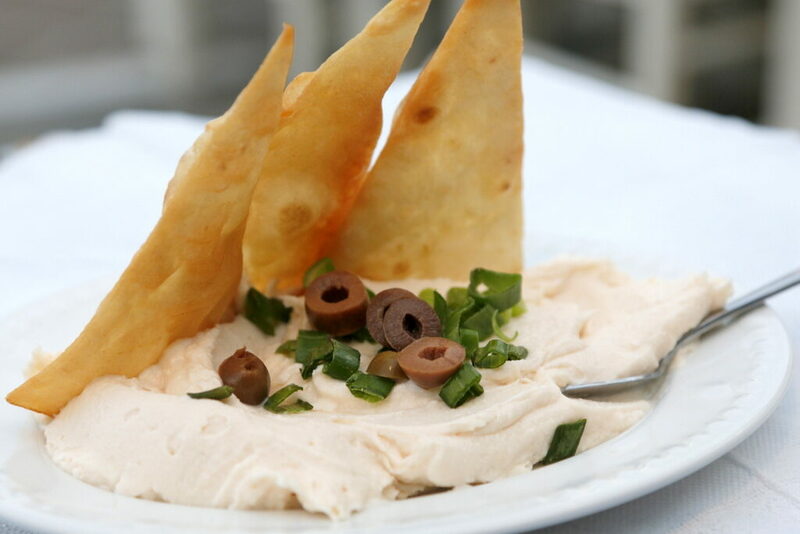 Have it as a meze dish with some fresh pita bread or as an addition to other dishes (dip for veggies or meat). This is another version of caviar. Taramosalata is made from salted and cured fish eggs mixed with olive oil, lemon juice, and a starchy base of bread or potatoes. It is usually served as a meze dish with some pita bread. Aubergines or eggplants are an important vegetable in the Greek cuisine. Again, they are the tastiest in summer time, but you can find them all year round. In our opinion the most flavoursome Melitzanosalata is made from slightly smoked aubergines. Sometimes smoked roasted peppers are added to it, which is a great combination of flavours. Eat it with fresh pita, rusks or as a side dish. Of course when in Greece you are probably going to eat a ton of feta cheese. Like we mentioned earlier, Greeks like to add it to almost any food! This lovely feta dish is a little less known to non Greeks. Trust us, it is worth trying! 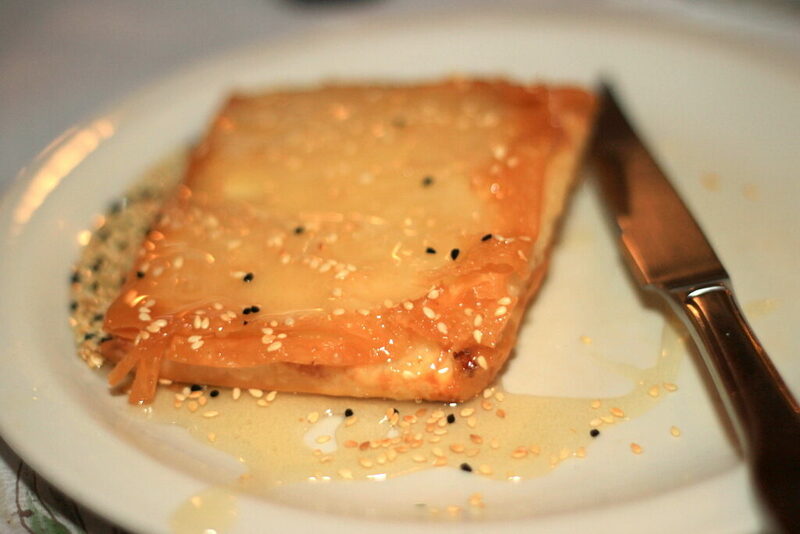 Baked in phyllo pastry with honey and sesame seeds (sometimes also chilli for a lovely sweet and spicy flavour) it literally melts in your mouth. Yum! 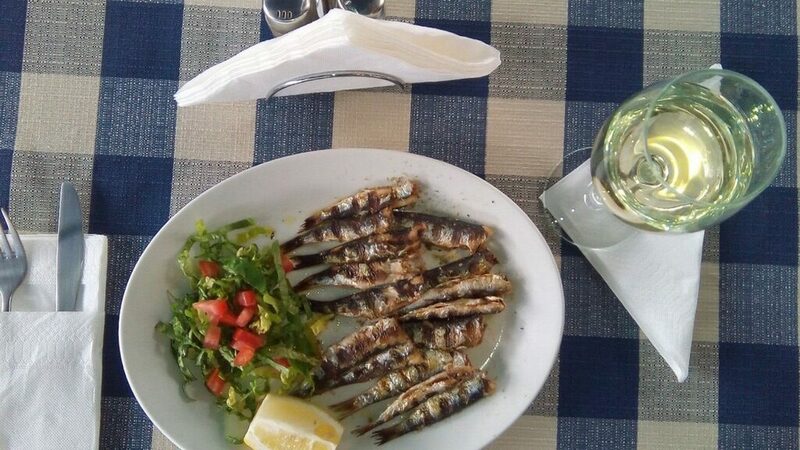 Grilled sardines, when fresh, are to die for! Forget about all those canned ones! This is the real deal. And like gavros, they are super healthy (they contain a lot of Omega 3 fatty acids). Sprinkle them with lemon and olive oil. Enjoy! Best time for prawns is winter and spring. The ones you find in summer are probably frozen, but at least they haven’t been frozen for that long. If you are lucky to be in Greece during the prawn season, it is a treat. The best prawns we have tried were from around the Methana peninsula just around the corner from Poros. They were still alive when we bought them! 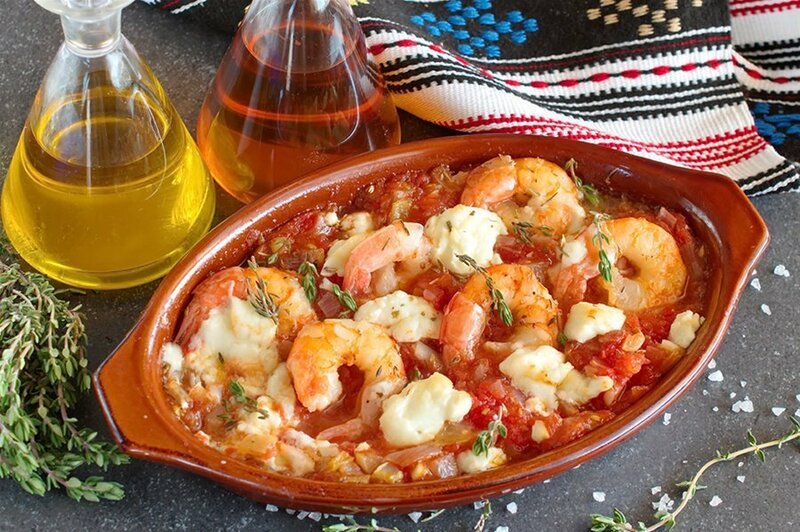 One of our favourite prawn dishes is saganaki style. They are baked in the oven in tomato sauce, onion, fresh herbs, garlic and of course feta cheese! 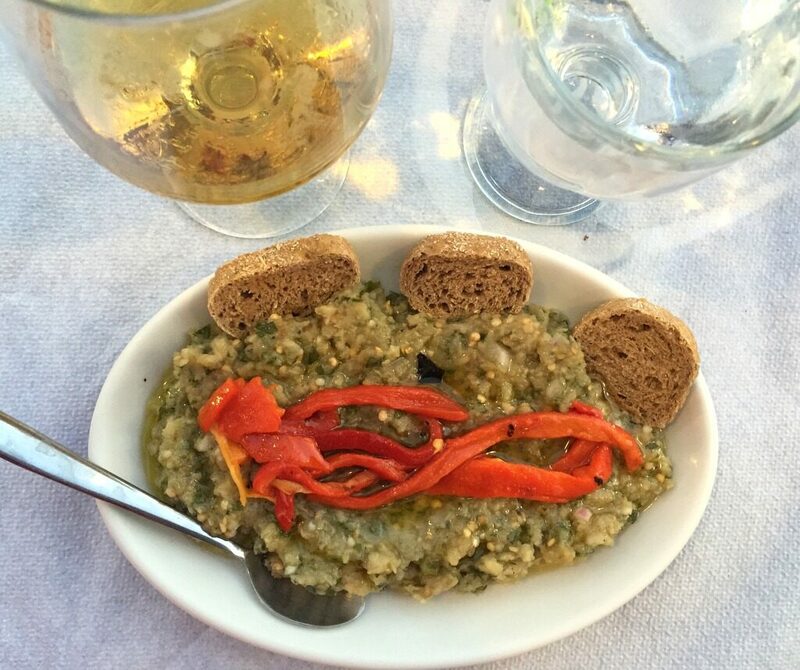 Make sure you give this dish a try next time you are in Greece. We are not big meat eaters (Periklis is strictly vegetarian or pescatarian actually), but Greek lamb is something else. It is the most natural meat you can eat (no hormones or antibiotics), especially when it comes from our butcher friend Paris :-). Kleftiko is a really tasteful way of preparing lamb. 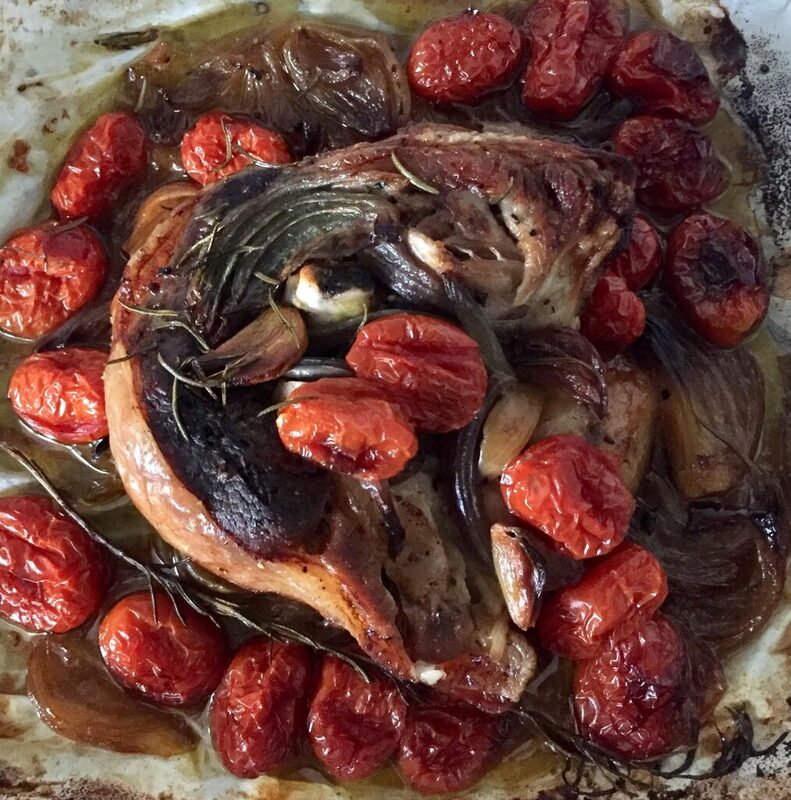 It is slowly roasted (in parchment paper) with herbs and usually potatoes. Magdalena likes to add some onion, garlic and cherry tomatoes. Meat eaters, this dish is not to be missed while in Greece! We hope this list will help you with your food choices next time you travel to Greece. When you place your order at a taverna try doing it the “Greek way” – order many different dishes so you can share among each other. That way you will be able to taste so much more!